Jesse is hungry for adventure! From backcountry skiing to rock climbing to whitewater canoeing, Jesse is always looking for opportunities to get out and get after it. A Wisconsin native, Jesse has followed the mountains’ siren song westward since graduating from Northwestern University in 2013. 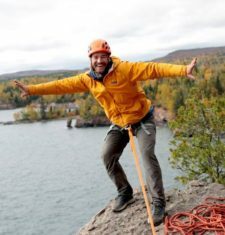 After spending three winters as a ski instructor at Jackson Hole Mountain Resort in Wyoming and four summers as a Wilderness Instructor at the Voyageur Outward Bound School in Minnesota, Jesse moved to Seattle to explore all the Pacific Northwest has to offer. Jesse loves to learn new skills and holds certifications as a Wilderness Medical Associates Wilderness First Responder, a Professional Ski Instructors of America Level 1 and Children’s Specialist Level 1, an American Institute for Avalanche Research and Education Level 1, and a Swiftwater Safety Institute Swiftwater Rescuer. Jesse loves to share his love of outdoor recreation with others and looks forward to meeting you at one of our many programs or events!